Are you interested in having such an amazing journey o know more about traditional culture in some countries? Then you have to come to Indonesia since this country is well known about its rich traditional culture around the world. The shadow puppets show in Indonesia or it is also called as WayangKulit performance is a popular show among other countries. When you come to visit Indonesia, it will not be perfect without watching one of its performing arts and the best recommended is watching WayangKulit show performance. The word ‘Wayang’ means ‘theatre’ and ‘Kulit’ is referred to the medium of making shadow puppet which is leather. The construction of making this shadow puppet need carefulness of the expert shadow puppet creators with several tools. Puppetry is one of the special parts of Indonesian traditional art culture. 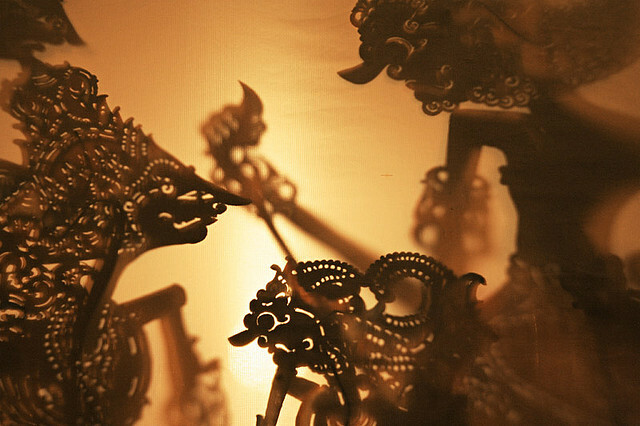 The shadow puppet is popular in Bali and Java, especially in East Java and Central Java. The traditional story in this shadow puppet is rich of culture value of local people which is usually the fight in between the good and the evil. It presents tales of morality, myth, and mystery. Though the puppets are hidden in behind the sheer screen, it is decorated well with high technique often with shiny accents. Come there to have memorable experience of this lively shadow puppets theatre for all ages! WayangGolek. It is three-dimensional puppets which are made by wood. WayangKulit. It is what internationally called it as shadow puppets. It is made with leather and the most well-known one. Nowadays, the performance of Wayang Kulit and Wayang Orang is still held at Keraton Yogyakarta and Keraton Solo regularly. Keraton means the Sultan’s Palace in Javanese. The shadow puppets show performance is still the most popular traditional art from Indonesia. Visitors who are interested in observing and learning the intricate of shadow puppets making are welcomed in Kepuhsari Village, Wonogiri, in Central Java. The stories of shadow puppets are based on classic story of Hindu Saga which is known as classical wayang. The performance of shadow puppets is a grand event which is held at night accompanied with the traditional gamelan music orchestra. If you are lucky, you can watch the shadow puppet performance at wedding party, birth events, religious ritual, and the other celebrations. This performance is enlisted in UNESCO as one of the Humanity Heritage Masterpieces. Therefore, it may be the best experience ever if you come visiting this country and watch the performance of shadow puppets.